Phillip Crews, professor of chemistry and biochemistry at UC Santa Cruz, has received the 2008-09 Outstanding Faculty Award from the Division of Physical and Biological Sciences. This annual award recognizes faculty excellence in research, teaching, and service. "Professor Crews' scholarly achievements have been profound. He is an exceedingly respected scientist who puts his relentless enthusiasm behind every aspect of research and training in which he is involved," said Stephen Thorsett, dean of physical and biological sciences, in a letter announcing the award. "Professor Crews has made seminal contributions in fundamental areas of natural products and has been an excellent teacher and mentor to undergraduate and graduate students, in particular underrepresented students," added Olof Einarsdottir, professor and chair of chemistry and biochemistry. 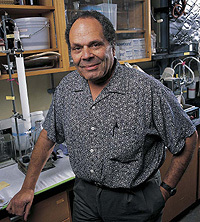 Crews is renowned for his work on the chemistry of marine natural products and has published over 180 papers in the field. He isolates and characterizes unique chemicals from sponges, algae, and other marine organisms, searching for compounds with potential therapeutic value in treating human diseases. Crews and his collaborators have identified several compounds that show promise for the development of drugs to fight cancer and other diseases. The pharmaceutical company Novartis is currently conducting clinical trials of potential anticancer drugs derived from a group of compounds Crews discovered called psammaplins. In addition to his research achievements, Crews has fostered the growth of many young scientists throughout his career. He has mentored more than 60 undergraduate students who have worked in his lab at UCSC, as well as 10 master's students, 28 doctoral students, and 34 postdoctoral associates. A popular teacher, Crews brings "true excitement into the classroom," Einarsdottir said. In 1994, with a grant from the National Institutes of Health, Crews founded the ACCESS program to introduce students from underrepresented backgrounds to research opportunities at UCSC. Every year, the program brings students from regional community colleges to UCSC, where they work with faculty mentors to conduct their own research studies in the physical and biological sciences. Crews, who joined the UCSC faculty in 1970, has received substantial recognition for his contributions to the field of natural products and to the UCSC campus. His honors include the American Society of Pharmacognosy's 2008 Research Achievement Award and UCSC's 2004 Excellence through Diversity Award. Crews was elected a fellow of the American Association for the Advancement of Science in 2008.